Using the RFC6598 address space (100.64/10). So, I recommended that we create a proof-of-concept to see if we could actually route Elastic IPs over an IPsec tunnel to the VPC. 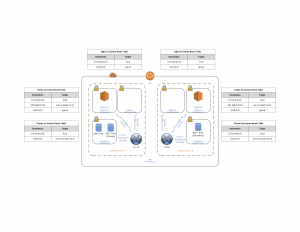 This would require finding a solution outside of the standard VPC VPN configuration, as there is a critical constraint which affects the customer requirement. This would require configuring one CSR instance in east-1a and one CSR in east-1b as well as two additional subnets in the VPC (let’s call these subnets Edge-1a and Edge-1b). Each CSR is configured with three interfaces: one interface in the Edge subnet, one interface in the Public subnet, and one interface in the Private subnet. All traffic from each private subnet should use CSR private interface as the gateway. Traffic from the public subnets should use the CSR public interface for traffic destined to any 192.168.0.0 network (our company’s subnets) and should use the IGW for internet-bound traffic. The CSR edge interfaces must use the IGW for egress. 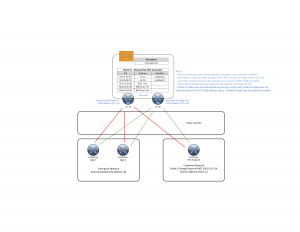 Before getting info the configuration details of the CSRs, let’s explore the initial VPC configuration to support this POC. RTB Public-1b: 0.0.0.0/0 via VPC IGW. 192.168.0.0/16 via CSR-1b Public-1b interface. RTB Private-1b: 0.0.0.0/0 via CSR-1b Private-1b interface. Important to remember is that the route tables contain an entry for the VPC prefix as a local address; that is, each route table has a ‘Local’ route to 172.16.8.0 /21. This understanding will be necessary when it comes time to configure high availability. 10.3.3.3: This will be used for the csr-1a Loopback1 interface. 10.4.4.64: This will be used for the csr-1b Loopback1 interface. With the problem and proposed solution now defined, it’s time to start the fun part – configuration! That will be covered in the next post.